I remember as a chid always begging my mom to buy me the Bonne Bell lip balm! Their products always have names that sound so delicious and they smell even better. I was browsing at Rexall the today and found this on sale for $2 CAD. It was originally around $4, which is still really affordable. 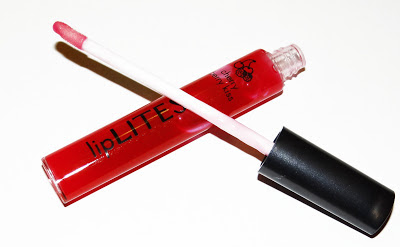 This lip gloss smells like a mix of every berry: strawberries, cherries, raspberries, and blackberries! The color is a cherry red. This lip gloss is non sticky, and goes on very smooth. As soon as I put it on my lips I love it! This gives you a nice slight red tint to your lips, it's the a little like you just ate a popsicle but very bright. There is a gold tint to this lip gloss but you don't feel the glitter. It's hydrating and I don't find that it dries out my lips. Its gives you a nice shine to your lips. I've started to keep this in my bag everywhere I go and when I need something more light and just a tint of color I use this. Overall I really do love this shade and the texture. I want to try out the other colours, I've heard that the Strawberry Parfait is a nice pink that looks natural.